"Should we buy a stock in anticipation of its positive news during results period?" Let us discuss and find out more in the following article. Every three months, most public listed companies will release their quarterly earnings reports in a period known as earnings seasons. Each earnings period normally start one or two weeks after the last month of each quarter (Dec, Mar, Jun and Sep). In other words, most earnings release is in Jan-Feb, Apr-May, Jul-Aug and Oct-Nov periods. Not all companies report during earnings season because the exact date of an earnings release depends on when the given company's quarter ends. As such, it is not uncommon to find companies reporting earnings between earnings seasons. Trading volume is usually higher during this period and stock price is more volatile. Why? Earnings essentially tell us how well a company is doing. If earnings cannot meet its consensus estimates (normally by analyst), it is called "earnings miss" or negative surprises. Vice versa, if earnings exceed consensus expectations, it is called "earnings beat" or positive surprises. Therefore a stock can see tidal movements if the results deviate from what the market was expecting. Experience traders often use the earnings season to their advantage. Strategy is to initiate buy volumes prior to earnings period. Retail investors will then react to the price rise as rumoured certainty of earnings beat. It is plausible that more people will buy into the stock driving the share price further up. Once target price is achieved, traders will then sell, either 1-2 days before earnings date or immediately after. Prior to earnings date, most analysts will try to calibrate expectations by providing a conservative earnings estimates. This is so that company can still beat earnings by a cent or two during announcements. If a company still misses in spite of this, the share price is sure to drop. An earnings miss is devastating for a company’s stock price. You can probably get whacked for double digit percentage point losses. Let us illustrate using Super Group Ltd share price as an example below. Traders bought on 4 Aug at S$1.48 before results announcement date. Once price rise 2.7% to S$1.52, traders began selling to take profit. 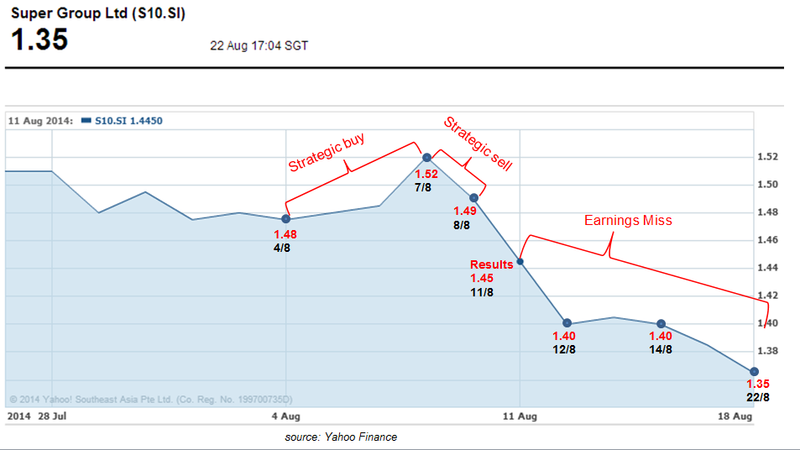 This occurred on 7 Aug, two working days before earnings date. 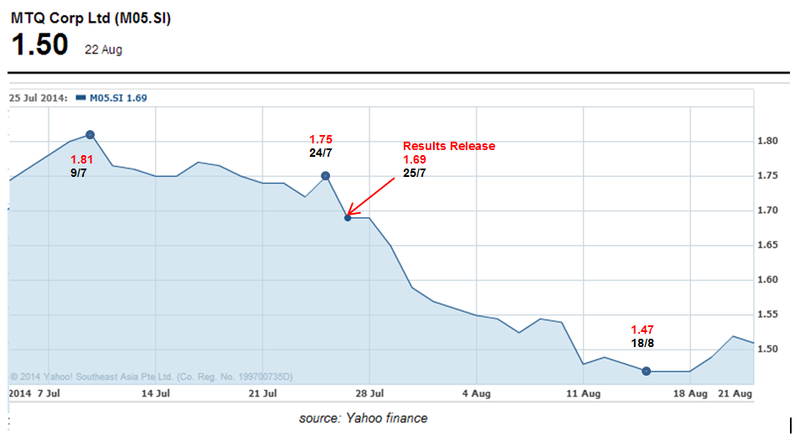 Poor results reported on 11 Aug. Hence price slides 3.6% within a day to S$1.40. 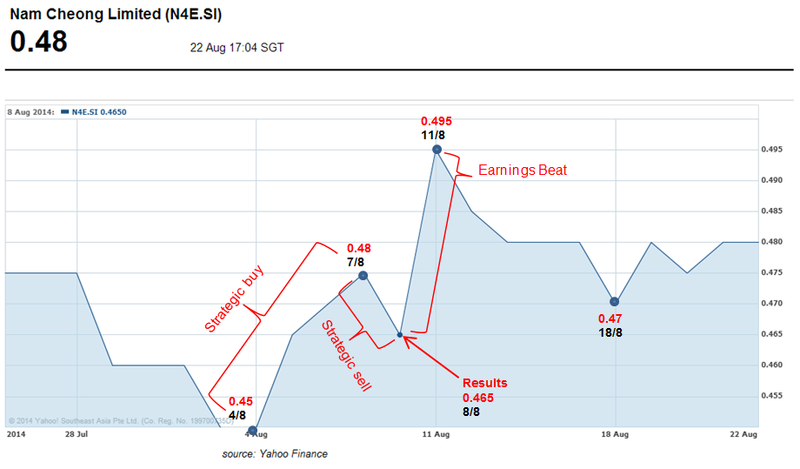 Few work days after, the price "seems" stable at S$1.40 on 14 Aug. You may think it is a fair price to buy considering the strong fundamentals of the company. You are wrong! Price continued to slide a further 3.7% to S$1.35 one week later. Overall, the stock price fall 7.4% since the earnings date, and a total of 11.8% in two weeks or so. Another example of “earning miss” from MTQ Corporation Ltd causing share price to free-fall 20% within less than a month. If you speculate that a company will have positive earnings surprise and make a buy call prior to results date, you are probably taking a big risk. This because an earning miss means you will be crushed by price fall of 10, 15 or even 20%. Yet, if there is a earnings beat, you will likely to see only mediocre rise or even flattish outcome. 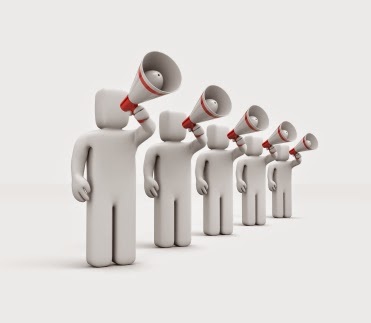 Often times, traders/investors already factor in the price way before earnings is announced. Therefore when earnings exceed analyst expectations, price will not rise. Instead, you are likely to see price dip when traders/investors adopt the strategy aforementioned and take an exit position to reap profits just before or after the earnings. Let us illustrate using Nam Cheong Ltd share price as an example below. After the positive result releases, Nam Cheong share price shot up 6.5% to S$0.495 within one working day. Instead of expecting share price to increase further, traders start selling to reap profits and share price dipped 5.3% to S$0.47. It had since rise a mere 2% to S$0.480 and stay stable. Despite the strong results reported, share price rise only a tad above the price prior to earnings. Even when there were several new orders announced afterwards, it is not sufficient to pull the price up during this period. For long term investors, the best strategy during earnings periods is probably to do nothing. If there is one thing you may want to do, it is to reduce holdings in company that you are anticipating a negative surprise due to weakening of fundamentals or pessimistic outlook going forward. If a stock beat earnings expectation and you miss the opportunity to buy immediately after, do not rush into it when the price is already high. It is never too late and you always have more time later to act. In fact, studies shown that even good stocks with high expected earnings growth tend to have prices underperform over periods of time. This is because it is so difficult to exceed high expectations over an extended timeframe. Similarly if a stock miss the earnings and took a plunge, do not buy it immediately thinking that the price is already rock bottom low. There is a chance that the stock will continue to underperform the market for some time and slide further. If you think that the stock earnings decline is transient and has good long term fundamentals, give it some time for the price to settle before you act. It is better to be patient and wait until the tide has calmed and the mold set. This will be the time to decide if the earnings report was good or bad, which we can then base our buy or sell decisions upon. This is an extremely well written sharing with detailed explanation and graphics on why it is not wise to buy a stock in anticipation of its positive news during results period. I look forward to more of such posts soon! You are gifted to write to educate! Grateful that you dropped by. I am really flattered by your comments. Thank you. "The Hat is probably too big for me to wear!" 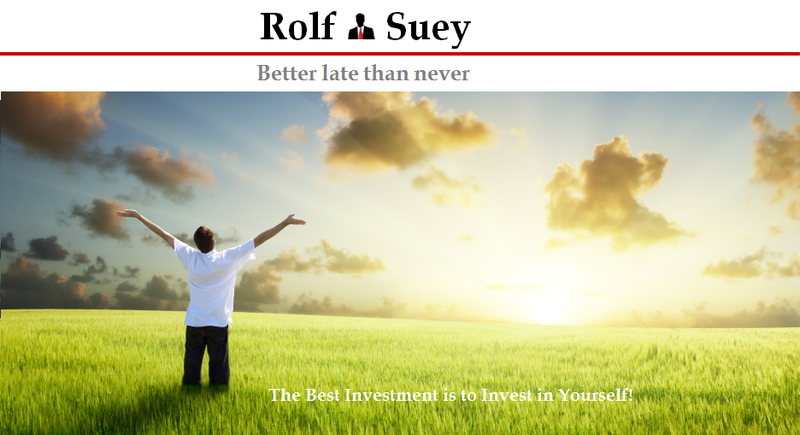 - I am still a newbie in investing and learning each day. I read your blog too, I am impress by it and already bookmarked it.